In front of a screaming crowd, twenty shirtless Palmetto boys strutted around the auditorium stage, competing for the Mr. Panther title. The boys came on stage with a dance choreographed by four variations girls, who stated that in practice they had a hard time paying attention. The danced to “Grease Lightning” for the “Grease” them, using choreography from the movie. Before deciding who the top ten would be, the boys did the swimsuit portion. The boys walked across stage in their swimsuits, flexing and making funny poses. Finally the judges decided who would make it to the top ten. In no particular order the top ten were Mr. HIP, Mr. Spanish Club, Mr. TVP, Mr. HIV Peer Educator, Mr. Italian Honor Society, Mr. Psychology club, Mr. Special Olympics, Mr. Student council, Mr. Soccer and Mr. Volleyball. Moving on, the top ten went into the talent portion. To start it off Mr. Olympics did a dance to a remixed song and Mr. Psychology juggled basketballs. Then Mr. Volleyball did some unicycle tricks, and Mr. Soccer threw some footballs into a trashcan carried by two girls. This was followed by Mr. HIP rolling around the stage on his hoverboard while wearing a unicorn onesie. Mr. Italian Honor School gracefully danced on stage, but knocke down a cardboard sign in the process. He recovered from this fall and continued to dance and impress the crowd. After this Mr. Spanish Club performed a magic trick. He called up a volunteer and asked her to think of a name, then he guessed the name she was thinking of. Next up was Mr. TVP. Despite his left leg being injured he performed a taekwondo act kicking with his right leg and punching through wood and cement blocks. Mr. Student Council came up and solved a Rubik’s cube underwater within one minute. Lastly Mr. HIV Peer Educator did some tricks with a soccer ball to the beat of “Waka Waka” by Shakira. After the talent portion, the top five were chosen,including: Mr. Italian HS, Mr. HIP, Mr. Special Olympics, Mr. Spanish Club and Mr. TVP. To choose the next Mr. Panther the hosts asked the top five a random question. Once they answered the questions the judges decided. While waiting for the judges to decide, Mr. Creative Writing played the piano and a friend sang a Sam Smith song. The crowd turned on their flash lights and waved their phones to the song. Finally, the moment everyone was waiting for came up. Mr. TVP, won Mr. Panther 2017. The other nineteen boys ran up to him and lifted him up, cheering him on. 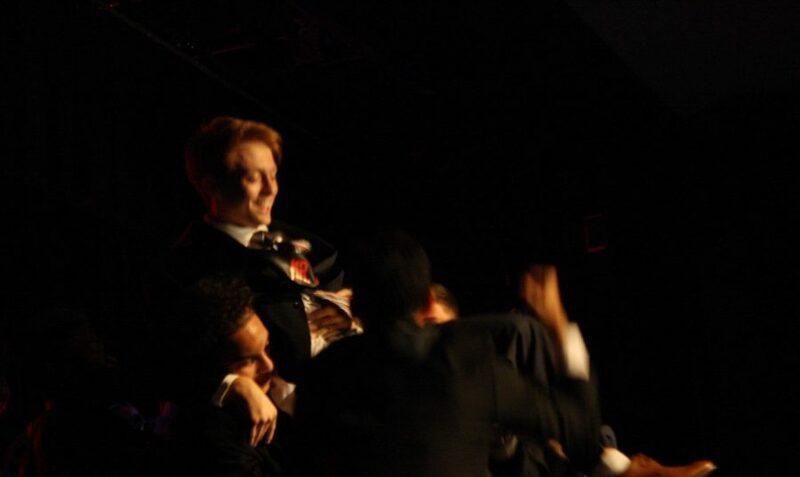 Mr. TVP wins Mr. Panther and the other contestants lift him up and cheer him on.